Carter Anthony Beauford was born on 2 November 1957, in Charlottesville, Virginia USA, and is a percussionist and drummer, best known for being one of the founding members of the Dave Matthews Band. He’s become well known for his ambidextrous style and his capability to adapt to a variety of genres. All of his efforts have helped put his net worth to where it is today. 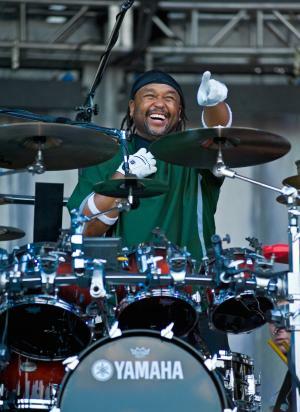 How rich is Carter Beauford? As of mid-2016, sources estimate a net worth that is at $65 million, mostly earned through his success in the music industry. He’s been praised many times for his drumming style, and also for singing back-up vocals for the Dave Matthews Band. He’s recognized as one of the greatest drummers of all time, and all of this has ensured the position of his wealth. Carter started gaining an appreciation for the drums at a young age when his father took him to a Buddy Rich concert, because no one was available to babysit him. Afterwards, his father would buy him a tin drum set which fueled his interest in learning the instrument, and subsequently, he would start to perform professionally at the age of nine. According to him, he accidentally became ambidextrous because he practiced in front of the mirror and tried to emulate his favorite drummers by making his reflection look similar to those shown on the television. The result was that he actually performed in reverse and accidentally developed his ambidextrous skills. Later on, he would attend Shenandoah University and would graduate with a degree in Occupational Therapy. After performing for a few years, Carter formally joined the band Secrets which focused on the jazz fusion genre. He along with LeRoi Moore, Jon D’earth, Butch Taylor, and Tim Reynolds would perform all over Virginia, but Beauford also undertook various jazz performances in several locations with a band called Blue Indigo, which also found some popularity when they were featured at the Delaware Water Gap Jazz Festival. Eventually, Secrets performed at the bar where Dave Matthews worked as a bartender and Dave would approach them with an offer to make music together. This would lead to the formation of the Dave Matthews Band. Carter’s net worth was well established. Even after the formation and the increasing popularity of the Dave Matthews Band, Carter would still find himself collaborating with other artists. Some of the projects he became a part of had him work with various big names include Carlos Santana, Vertical Horizon, and Victor Wooten. He would eventually win several awards during his career, most notably Modern Drummer’s Award for Best Pop Drummer and Best Recorded Performance. For his personal life, it is known that Beauford has a daughter from his first marriage. He also has two children from his second marriage to Karen. The family is briefly mentioned in a DVD entitled “The Gorge”. Aside from this, he is known to use a Yamaha Drums custom kit with Zildjian cymbals. His kit is also filled with assorted accessories and percussion including woodblocks. There was originally supposed to be a Yamaha Signature “Carter Beauford” snare drum but it has never been released. 3 Was a member of the 80s band, Secrets, with Dave Matthews Band pianist Butch Taylor. 4 Is a former history teacher. 5 Daughter with wife Karen, Nadja Angelique Beauford born October 5th 2001. 6 Has a daughter named Brianna Simone from his first marriage. The Hitcher 2007 writer: "Out of My Hands"
Standing Still 2005/II writer: "Proudest Monkey"
Dave Matthews Band: The Gorge 2004 Video documentary writer: "Pig"
The Fighting Temptations 2003 performer: "I Won't Quit Till I Get Home" / producer: "I Won't Quit Till I Get Home" / writer: "I Won't Quit Till I Get Home"
Dave Matthews Band: The Videos 1994-2001 2001 Video writer: "Too Much"
Dave Matthews Band: Listener Supported 1999 Video documentary writer: "Rapunzel", "#41", "#36", "Too Much"